first of all, thanks for all your kind comments about my summer blocks quilt. many of you asked about the pattern, and for the next 6 months it's the property of sew hip. after that, i'll be sure to make it available. Several months ago, I wanted to test some spoonflower fabric, so I made a doll quilt (so fun, start to finish in just a few hours). and the next day I wanted to make another. 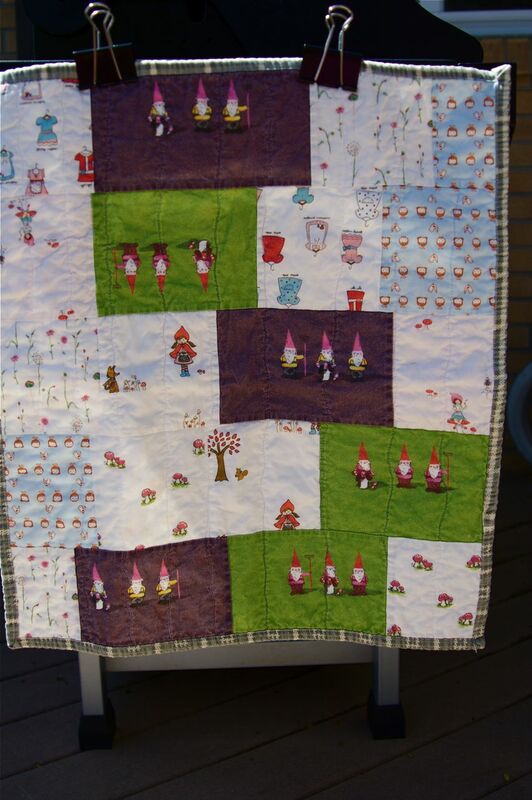 It was then that I decided I was going to make one doll quilt every month...(that was back in february). Well, a doll quilt a month didn't happen, although I still have hopes. It just seems time comes and goes way to fast. That reminds me, I also started taking a photo a day at the beginning of the year...I kept up with that for several months, but just realized the other day that I let that one go too. I'm perfectly okay with it though, if a hobby becomes forced or stressful, what's the point. isn't this dress print the cutest? You can find it here. I love the back of this quilt...it's a japanese print I've had for a while. I didn't have a big enough piece to use on a large quilt, but it's perfect for this doll quilt. What a great idea to use a border print for the backing! We had several pieces of border print donated to our quilt ministry and I have been racking my brain trying to figure out the best way to use them! 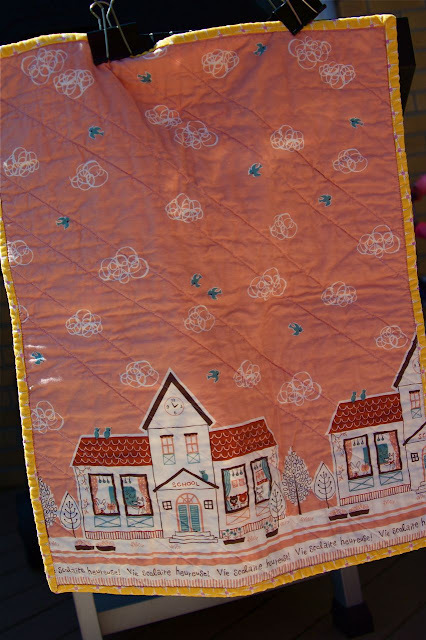 And your little doll quilts are so sweet!!! Those are both totally adorable!!! Very cute! Aren't doll quilts fun! These are darling! Can you tell me who makes the cute print that has the girls' dresses on it? 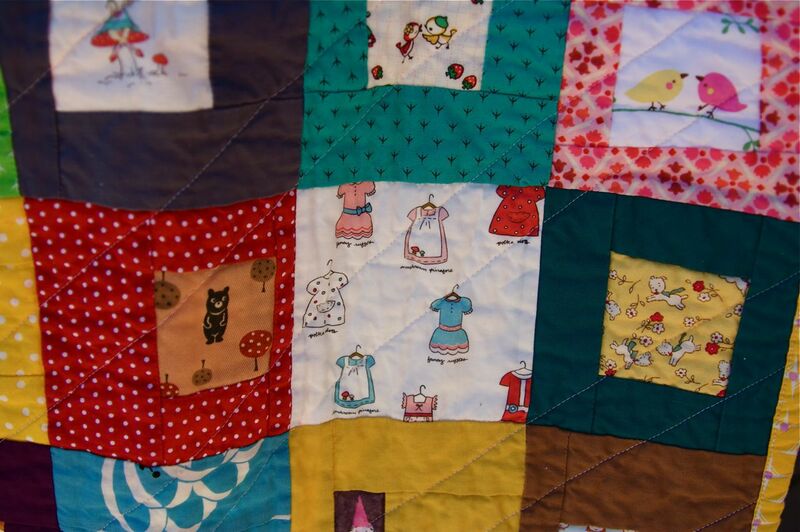 I really like the idea of a dollquilt a month - though I'm not sure I could keep it up either. Every doll needs a cute quilt. I love the second one... your quilts are always lovely! I love your doll quilt! I've started giving my doll size quilts for new baby gifts. They are perfect to use over a baby in a car seat and you don't have all that excess blankie to worry about. Add a satin edge and then you've got a "carry around" blankie that makes a 2 year old very happy! Pop on over to my website this week for a vintage block giveaway! I love the fabrics in both. Love. How fun and pretty! 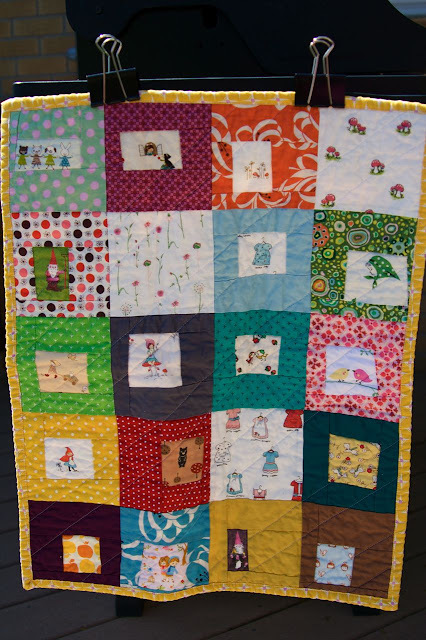 I wanted to leave you a comment to say hi and tell you that your quilts are inspiring to me! I should be able to find some time to quilt if you have three kids and have had time to make 75 quilts! I saw your feature on Fat Quarterly and thought I'd stop by to say hi. You're on my google reader now. So I'll be back! !